In case you haven’t noticed the music and/or decorations adorning or blaring from your neighbor’s driveway/local grocery store/favorite department store/radio station, the holidays are here! Since there’s no snow to shovel and no time spent waiting for cars to defrost, use those extra minutes to take advantage of the exciting warm-weather holiday and non-holiday activities Oahu has to offer and save the winter hibernation for our sweater-wearing friends up north. Winter in Oahu means it’s time for big waves in the North Shore. Watch Mother Nature delivers some of her best work as the world’s best watermen tackle some truly breathtaking big waves. Rent some ice skates and kick off the winter season by spinning around Ward Village’s open-air rink, just steps away from the beach. Grouchy old Ebenezer Scrooge gets musical in this Broadway iteration of Charles Dickens’s famous tale of a wealthy man learning the true meaning of Christmas. Now that Thanksgiving leftovers have been consumed, it’s time to get into the holiday spirit. 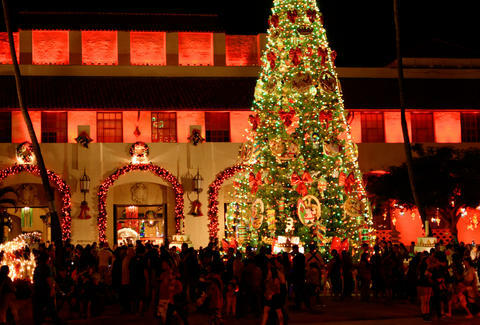 There’s no better way than partaking in the 31-year tradition of watching the home of the City and County transform into an island-themed winter wonderland, complete with a shaka-wielding Santa and Mrs. Claus, a towering pine tree filled with lights and an electric light parade. In case you forgot to check off “watch surf contest” from your 2016 to-do list, the World Surfing League saved their biggest competition for last. Held at the infamous Banzai Pipeline, big wave surfers from around the world gather to compete for the prestigious Pipe Masters glory. The monthly event to celebrate beverage and entertainment brings you Absinthe Makes the Heart Grow Fonder, where you can sip on the famed boozy tonic—just leave the ear cutting where it belongs Van Gogh—in history. Who needs a chimney when you’ve got an ocean? Santa comes early in Waikiki, and you can greet him when he gives Rudolph and other reindeer the day off, as he arrives via outrigger canoe. If the number of names on your Christmas list is stressing you out, this one-stop holiday shop is where you’ll find locally made goods, food products, books, clothes, jewelry and crafts. The best part? No mall parking. Post up along the 26.2 mile trail and watch runners wear out their sneakers as the sweat, pound and consume copious amounts of water to earn that coveted finisher medal and t-shirt. Don’t wait till Christmas Eve to finish your holiday shopping. Peruse over 200 vendors and find everything from clothes, toys, collectibles, gift baskets, food items and stocking stuffers all under one roof. Directed by John Landovsky, the Hawaii State Ballet will transport you into a world of dancing toy soldiers, sugarplum fairies and dancing sweets, none of which are actually edible. Embrace your inner American Ninja Warrior and traverse through 3.1 hilly miles, while you tackle obstacles like rings, ladder walls and rope swings. Oh yeah, and bring a towel, because you’ll get a wee bit (extremely) muddy. Your reward? Kona Brewing Company beer and live music. Don a Santa hat or reindeer antlers and take a 5K tour through downtown Honolulu and pass through the Honolulu City Lights while simultaneously burning calories during this festive holiday walk/run. We call that a win-win. The four-piece indie-folk band gained notoriety as downtown Honolulu and Waikiki troubadours, playing the guitar, violin, cello and accordion/foot percussion street-side, gathering a large following before taking their gig to the mainland. The band returns for two shows—catch them before they’re gone. Find out why the star of “The Jim Gaffigan Show” was one of ten comedians to sell out Madison Square Garden as his Fully Dressed tour stops on Oahu for one night only. Hawaii plays host as eight college basketball teams face off in a three-day, twelve game invitational tournament with the championship game being played on Christmas Day. Spend the afternoon working on your tan in the sunshine while watching a Conference USA team square off against a Mountain West football team—all before Santa Claus comes to town. Jam out as the singer-songwriter takes the stage, performing songs from her first big label album. Ring in the New Year with four DJs and live entertainment as the Sheraton Waikiki transforms into a massive new years extravaganza, with RumFire, Helumoa Pool and the Infinity Edge Pool combining into one massive super party. High rollers can drop $200 for special access to the Champagne Room, where you’ll get exclusive access and well, champagne—and lots of it. Tickets to the Chicago-native’s first show sold out within hours, so a second show was added to appease the masses. Grab your tickets fast, if you can. The largest charity golf event on the island returns every January as hundreds of the biggest names in golf take the green. Opt for daily passes, a season badge, or VIP tickets, which get you a seat along the 16th hole, with a meal by Hy’s Steakhouse, two adult beverages and a view of the Pacific. The Auckland indie electronic pop band stops by the island, where they’ll perform their hits, fully clothed. Summer Nakaishi is a freelance writer for Thrillist who’s still busy stuffing herself with all things pumpkin spice.